RiverwestArtists Association’s ArtWalk 2009 marks the 30th Anniversary ofWisconsin’s oldest and largest walking art tour. 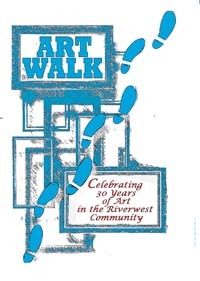 Conceived in 1979 incollaboration with the Milwaukee Art Museum as a way to introduce the public tothe way artists live and work, ArtWalk gave birth to the Riverwest ArtistsAssociation. On Saturday and Sunday, October 3 & 4 from 12 noon to 5 PM, artists open their homes, studios, galleries and businesses, inviting the public to see how artists live and work. There is also an Art Party at the Art*Bar October 3 from 5:30 PM – 9:00 PM. Riverwest Artists Association’s ArtWalk 2009 features over 65 established and emerging visual artists at 22 sites throughout Riverwest including the RAA Annual Membership Show, 30 Years of Dialogue, at the Jazz Gallery. Sue Pezanoski Browne will be doing a Make and Take Musical Instruments workshop and a Sound Garden Folk Art Installation and Sharon Giesfeldt Van Ruiswyk will be doing Make and Take Origamiworkshop at the Jazz Gallery. Limited Edition ArtWalk 2009 T-shirts, designed by artist Sharon Giesfeldt Van Ruiswyk to celebrate our 30thanniversary, are available in both men’s and women’s styles for only $10 at the Jazz Gallery and the Art*Bar. For just $3 for adults or $2 for seniors, students and children, patrons get a button and map good for the whole weekend. Buttons and maps will be available at the following sites during ArtWalk weekend: Art*Bar (722 E Burleigh); Riverwest Food Co-op (733 E Clarke); and the Jazz Gallery (926 E Center St). As an all-volunteer organization dedicated to supporting artists and connecting artists with the community, we are proud to produce Wisconsin’s largest and longest-running neighborhood art tour. Thanks to the tireless efforts of volunteers, members and friends in the community, RAA’s signature event, ArtWalk, opens the work spaces and the art work of neighborhood artists to the community.